Do you find that to be an interesting question? If you were to be completely honest, do you only return it when someone is watching? Do you never because you think, someone is hired to come gather up the carts and that is not my job? Do you have a pet peeve? This happens to be one of mine. Watching someone abandon their cart and watch it roll into a car or take up a parking space, or roll into the line of cars driving past, has made me stop and think, ‘there is more to this than meets the eye’. I believe there are two kinds of people in the world…cart returners and cart discarders. Whichever one you are, I believe, says a lot about you. Are you someone that takes the time to walk their cart back, no matter what. It could be raining. You could be in a hurry. Your 3 year old could be crying. I believe you are someone that thinks of others first. To make excuses, leave the cart half way up on the curb shows one thing about that person…it is all about THEM. Those that take the time, you are showing you care about the people that work at the store. You do not expect someone else to do it for you. You are not selfish. To take it one step further. When you see an elderly person walking their cart back, do you offer to take it for them? This all shows you care about helping others. 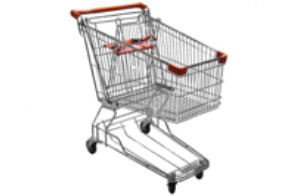 What else does being a cart returner say about you? It says you are disciplined. When it is raining, or a child is crying, or NO ONE is looking and you STILL walk your cart back, it is moments like these that define you. WHAT?? Returning a silly old cart. YES! There are times in everyone’s life when it is easier to NOT do the right thing. Walking the short distance shows you are disciplined. You are committed to a moral standard that you won’t break. Discipline is something that people admire. Disciplined people are able to achieve a whole lot more in life than undisciplined people. It has been said, “How you do some things is how you do all things.” Being selfish and undisciplined about returning the cart. Does that trait show up in other things? Yes. The beginning of this article is intended to somewhat entertain, although I do believe the premise. What this is all about is CHARACTER. What is character? What does a person with high moral character ‘look’ like? My John Maxwell Certification included a youth leadership program for us to use with young people called Youth Max. This program included 4 modules: positive self esteem, overcoming fear of failure, stand up and be counted (anti bullying), and character development. Within the character developoment module, one lesson the kids could relate to was the definition of character being, what you do when no one is looking. I knew this would get their attention. At this age, pushing boundaries and not getting caught is very relevant. Needless to say, this was an important discussion and important lesson. Why? When all is said and done, your character is more important to becoming a successful, flourishing adult than your talent. It is not uncommon for very talented people to be noticed and acknowledged. However, without a strong character, they rarely stay in the limelight for long. “Talented people are praised for what other people see them build. Character builds what is inside. Talented people are sometimes tempted to take shortcuts. Character prevents that. Talented people may feel superior and expect special privileges. Character helps them know better. Talented people have the potential to be difference makers. Character makes the difference in them. How do I build a strong character? When asked what do you want out of life? Common answers are, “I want to be happy”. Or “I want to be successful”. Have you ever heard, “I want to be good.”? People of character know there is no right way to do the wrong thing. They also know there is never a wrong time to do the right thing. When I work with parents, I encourage them to teach their children to do what’s right, no mater how hard that is. I teach that this is a good basis for decision making. Ask, “Is my decision the right one or is it simply the easiest one?” People of character choose the right decision. BEING the right kind of person. Someone that is honest, courageous, optimistic, kind…could go on and on. It is important to know, we all have work to do when it comes to improving his/her character. It is never too late to begin growing your character. Here are a few ideas. Only you know if you have done and been the best you could be. To the person of character, that is all that matters. People of character are known for their persistence. My son who was a swimmer in high school once told me when I began swimming laps for exercise, “When you think you have swam as many as you possibly can, swim one more.” I never forgot that and have applied that thought to so many things in my life. You too may be surprised that you are capable of so much more than you think. Success rarely happens overnight and success rarly happens without learning from mistakes. Do you possess a growth mindset or a fixed mindset? Carol Dweck pioneered this concept. From what I have learned from her, I teach teachers to praise children on their effort and process rather than results and outcomes. This kind of consistent praise results in children that love challenges and learning instead of fearing failure. Along the same thought, I have taught my grandchildren this mantra, “When things are hard, I try harder.” Another quote I heard by Roscoe Dunjee, “Some people succeed because they are destined to, most succeed because they are determined to.”Building character takes intention and awareness. Awareness of those you look up to and admire. Awareness as to who you want to be known as. Awareness as to what you want to be remembered as being. At the end of the day, the quality and depth of your life, your relationships, and your career is deeply affected by your level of character. Next time you are finished emptying that shopping cart, return it to where it belongs. That walk back to your car will be one filled with victory and pride knowing you just demonstrated you are a person of GOOD CHARACTER! !